Oooooo.... what a busy time we had... and Pa has gotten us a pretty good deal... one WHOLE chicken for a cool price of $1.99 each. It is unbelievably cheap. 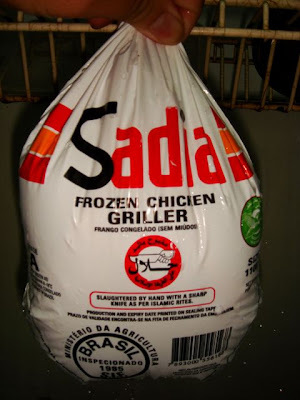 However, only 2 chicken per customer, so Pa had to get a little... *cough* creative. 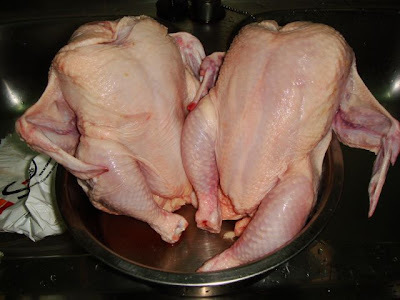 After letting them out of their bags... the Chickens were just lounging around... happy to be out of their tiny little bags I suppose.... add a little boiling water and you might think that they are in a Jacuzzi. Its kinda strange if they both started to have a conversation about dinner. 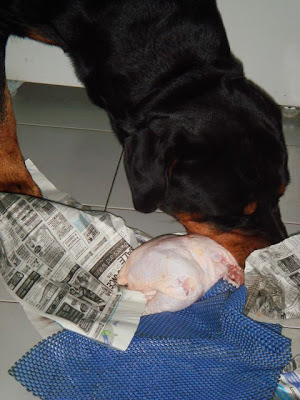 **For chicken lovers out there... this picture is not a Rottie eating a chicken... but rather Bruno was trying to resuscitate the chicken after he suffered from a minor heart attack. No birds were harmed in taking this picture. LOL $1.90 next time got such lobang share leh! Chickens would have most definatley have been harmed if I had been there!! BOL! I can't believe how cheap they are!! Chickens are around £4 each here.. minimum!! I think we need to emigrate! Wah! So cheap!!! One chicken here is already RM7++. I bet it was so tasty!